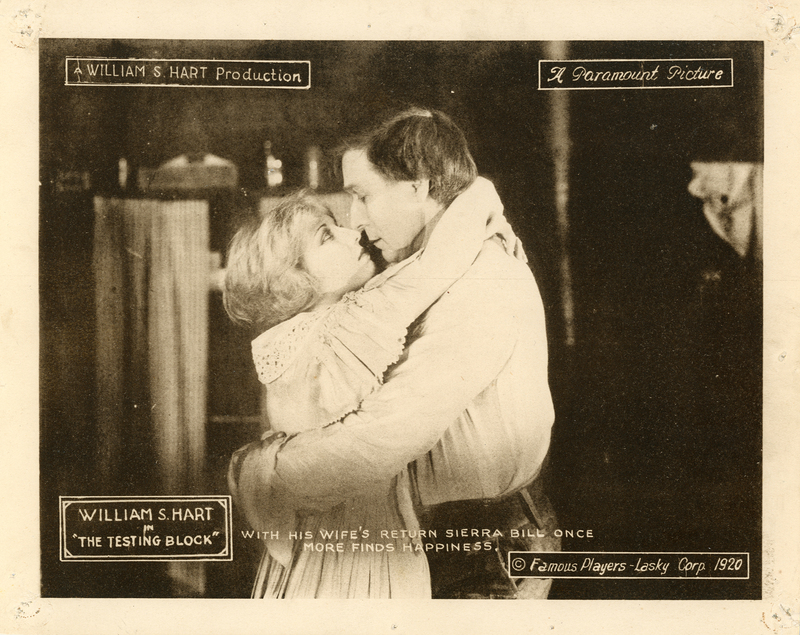 SCVHistory.com LW2878 | Film-Arts | Lobby Card: William S. Hart & Eva Novak in 'The Testing Block,' 1920. 8x10 sepiatone lobby card (standard size up to 1920) showing William S. Hart and his on- and off-screen love interest Eva Novak in "The Testing Block," distributed by Paramount-Artcraft Pictures in 1920. Teaser text reads: "With his wife's return, Sierra Bill once more finds happiness." Novak rejected his real-life marriage proposal (see Davis 2003:144). It was a habit (ibid. ); a couple of years later, costar Winifred Westover accepted. This particular lobby card was probably used in Sweden. "Vargarna 1922" is handwritten on the back, in script contemporary to the period. Literally meaning "wolves," "Vargarna" was the picture's Swedish title. The movie was distributed in Scandanavia in 1922-1923. Co-star Eva Novak's film career spanned from 1917 to 1966; she is best remembered for having been paired with Tom Mix 10 times. Produced by the William S. Hart Company; distributed by Paramount-Artcraft; released December 26, 1920; © November 8, 1920; six reels (5972 feet). Directed by Lambert Hillyer; screenplay by Lambert Hillyer from a story by William S. Hart; photographed by Joe August; art director, J.C. Hoffner. CAST: William S. Hart ("Sierra" Bill); Eva Novak (Nelly Gray); Gordon Russell (Ringe); Florence Carpenter (Rosita); Richard Headrick (Sonny); Ira McFadden (Slim). SYNOPSIS: "Sierra" Bill is the leader of a band of outlaws in the days of the California gold rush. His physical strength and courage are dominant, but his moral fibre has never stood the "Testing Block" of really bitter experience. In a raid to collect a reward offered for himself, he comes upon a poster of Nelly Gray, violinist in a band of strolling players. He and his men intercept the players and compel a performance. Nelly's violin plays havoc with the bandit's heart. He gives her a bag of gold and rides away with his followers, but not to forget her. Neither has Ringe, one of the bandits. The gold is taken by the managers of the players, and they leave the rest of the troupe stranded. The bandits decide to capture the women and draw lots for them. "Sierra" Bill wants first choice and proposes to fight for it. In order to be on a par with his drunken mates he drinks his fill. He downs one after another of the band and rides away. On reaching the hotel where the players are stranded, Bill encounters a justice of the peace. Half-crazed by drink, Bill drags the justice up to Nelly Gray's room and forces a marriage. He then carries off the girl. LW2878: 19200 dpi jpeg from original lobby card purchased 2016 by Leon Worden.